Tiptoeing With Tech: Devices And Relationships How do you use your electronic devices without ruining relationships? It's not easy. Some people covertly text while on dates. Others use their BlackBerry in the bathroom to avoid seeming rude. Here, a few lessons in modern mobile manners from people who have firsthand experience. To BlackBerry or not to BlackBerry? That is a question that can make or break a relationship for single or married people. How do you use your electronic devices without ruining relationships? It's not easy. Some people covertly text while on dates. Others use their BlackBerry in undisclosed locations. And some people multitask at home. Here, a few lessons in modern mobile manners from people who have firsthand experience. Beth Hughes is a veteran of dates interrupted by digital data. "I was actually out with a guy who had his phone on. I couldn't see it, but I could hear it," she says. "And I literally was like, 'Do you want me to check that for you? Are you not hearing that beep?' "
Hughes is single and lives in Arlington, Va. She's on the front lines of the battle to keep a potential mate's attention in the moment, and she's searching for a guy who knows when to use — and when to ignore — his mobile device. "I was fishing in my purse for a tissue or something, and I looked over, and I could tell that he was under the table like James Bond texting, you know, or BlackBerrying. And I was kind of like, 'Do you really think that I don't see you over there kind of like trying to hide your paraphernalia from me?' " says Hughes. "That's kind of rude. You do not want to see a guy's paraphernalia, at least on the first or second date." -- No blinking BlackBerrys at the bar. -- And no digital date-making. "It's almost like he was using the BlackBerry or the iPhone — whatever it was — as almost like showcasing his 'tech savviness' and the fact that he had a full calendar. And I was kind of like, hmm ... It really was a bit of a turnoff." Hughes told that guy she'd get back to him. Hughes is not alone in her desire to make the world safe from intrusion from mobile devices. But there are people who fall in love despite such electronic barriers. Anushay Hossain fell for her fiance, Shayan Pahlevani, just as he fell for his iPhone last year. She lives in Arlington, Va., and Pahlevani lives in nearby Washington, D.C. There's been an accepted menage-a-tweet since then. "The iPhone has been this presence in our relationship," Hossain says. "And at the beginning of our relationship, he was on that iPhone like it was his job. I always used to joke, and I still say, that his iPhone ... is the third person in our relationship." And maybe there's a fourth. Hossain has a BlackBerry. They sort of have everything worked out. "We'd be sitting on the couch and just watching TV, and I'll start talking to her, and she'll nod her head as if she's listening to what I'm saying. And then I realize she's been on her BlackBerry the whole time," Pahlevani says. Hossain says she's learned a lot from her fiance when it comes to using mobile devices. She says she can multitask and genuinely listen to her fiance, even when she's blogging. 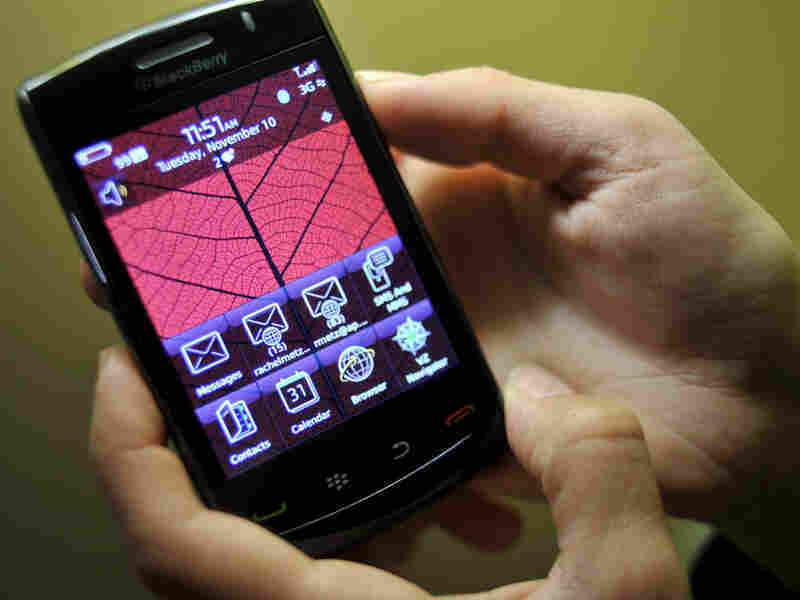 "I think a BlackBerry is always cheating," says Brendan Greeley, a married father. For Greeley, who lives in Annapolis, Md., the relationships came first — and then came the hand-held gadget. He's smart enough to recognize that you can't split your loyalty. "You're either cheating on work, or you're cheating on your spouse, or you're cheating on home, or you're cheating on your kids," Greeley says. But Greeley avoids conflicts between his wife and his gadget by using a separate locale where typing on his little keyboard won't be rude. "I told my wife, 'I just want you to know — I need you to know this first — that I'm going to tell America that I check my BlackBerry in the bathroom,' " Greeley says. "And it's true. You know, we're addicted to it. And I think that's exactly why it's cheating. You know, you duck into the bathroom sometimes when you don't need to use it, so that you can see what's happened. And I think that's exactly like having an affair — not that I would know." All this confusion over how to behave when a BlackBerry or iPhone intrudes on relationships may get worked out over time. One day, an open marriage — between one man, one woman and many hand-held devices — may be the norm. No doubt our children and grandchildren will be taught the etiquette for balancing all this. Until then, we'll have to fumble our way through BlackBerry interruptions and Facebook updates — making the rules up as we go along.